The control is available only in Webix Pro edition. UI-related multitext is a dynamic control based on standard Webix text input. It offers the possibility to add and delete additional fields on the go. icon (string) - the control's icon. 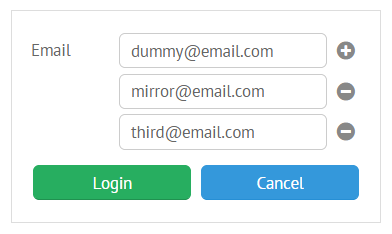 Each field of a multitext control features its own ID. It can be either a given (for the basic field) or an auto-generated one. All the methods of a multitext object can be applied to any field object. New fields are added at the bottom of Multitext parent layout. However, if you will create some other view after the Multitext one, new rows will be added after this view. With such a configuration, each new field will appear after the previously added one. Only additional fields can be removed, the basic one always remains. The methods can be called from any multitext object from the group. Multitext features an extended API for setting and getting its values. setValueHere and getValueHere methods for for working with the value of the first (basic) field.